Shaquille O'Neal (@THE_REAL_SHAQ) On Twitter - "Let's go Steelers let's go"
Shaq was showing his true colors on Sunday while cheering for the Steelers! 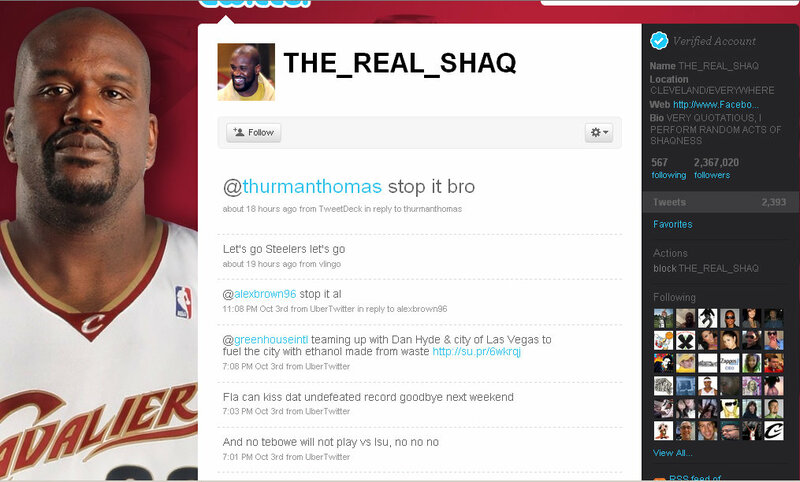 From his verified Twitter profile (@THE_REAL_SHAQ), Shaq says, “Let’s go Steelers let’s go”. Shaq has an impressive 2.3 million followers on Twitter, and equally impressive 1 million fans on Facebook. I can’t wait to watch the Cleveland games this year – Shaq and Lebron will surely dominate the court.